I’m a texture kind of gal. Even my peanut butter HAS to be crunchy. 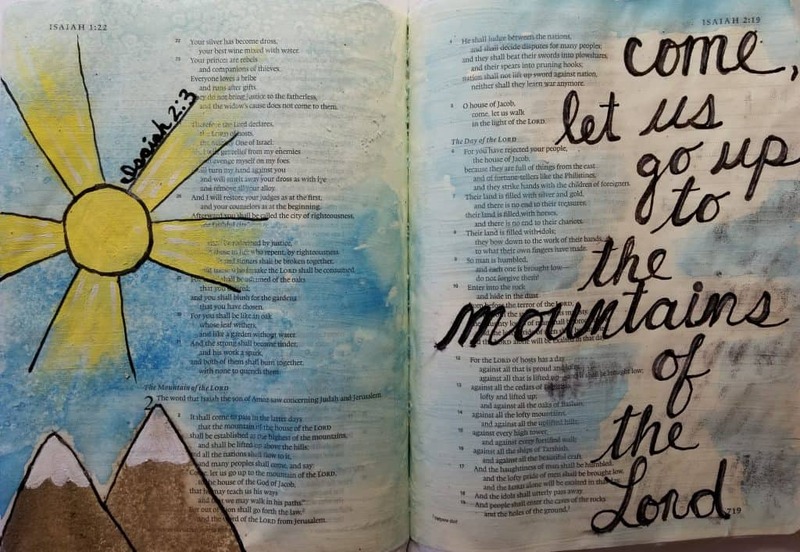 My Bible journaling is no exception. 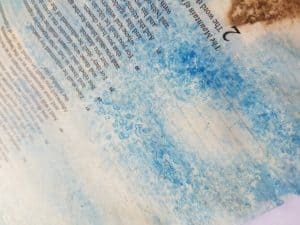 That’s why I love Bible journaling techniques that add texture to your pages without adding bulk. 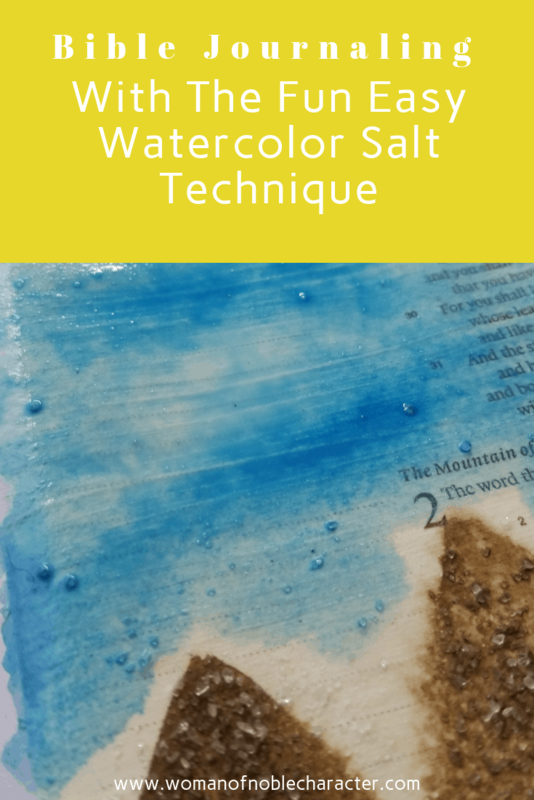 This watercolor salt technique is so fun and easy and adds beautiful texture to your pages. Watercolor paints (I use this basic set for regular watercolors. In a future post, I’ll share more watercolor techniques using other products). *Optional: Spray bottle with water. 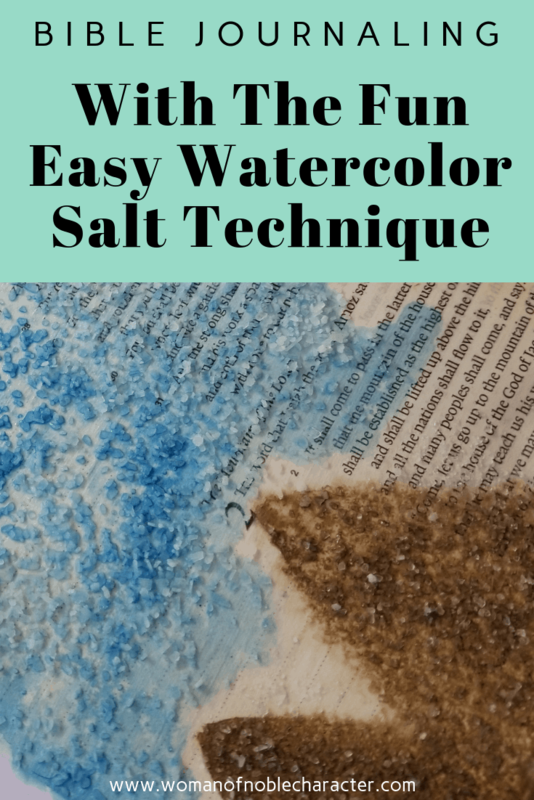 The key to this watercolor and salt technique is to use a darker color. You won’t be able to see the texture if you use lighter colors. 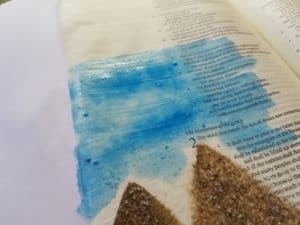 Bible pages are thin, by nature, so I find that by prepping the pages with clear gesso before you begin makes the page sturdy and allows you to use various wet mediums on it. 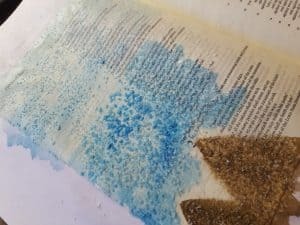 It also cuts down greatly on bleedthrough (the paint showing up on the backside of the page). Clear gesso is basically a clear acrylic paint designed to be lightweight and waterproof allowing you to add moisture without ruining the paper. Start by picking up some watercolor paint with your paint brush and paint on your page. In this example, I used brown for the mountains, blue for the sky and a slightly lighter blue for the upper sky. Since the watercolor salt technique only works when the paint is wet, I did it in stages. 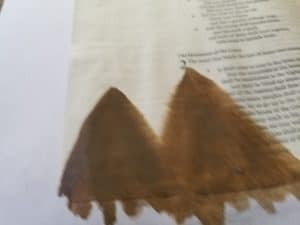 I painted the brown mountains then sprinkled kosher salt on the wet paint. Next, I painted the middle sky later and sprinkled sea salt on it. 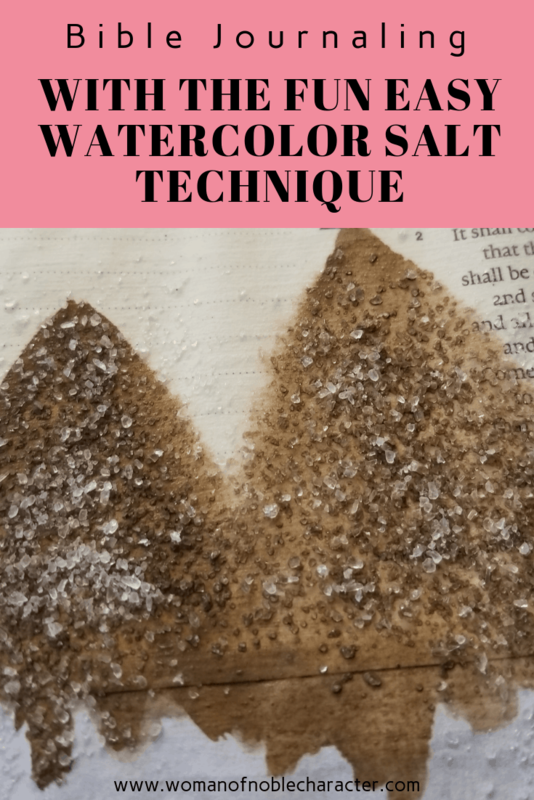 I wanted to see how the different types of salt reacted to the paint. Finally, I painted the upper sky and sprinkled regular table salt on it. This next part is the hard part – wait till it dries. I’m not very patient when it comes to creating, so I sped up the process by using a heat gun. Once the paint is dry (you won’t see the wet shine anymore), you’ll notice that the salt absorbed some of the paint. You can then gently brush away the salt. It helps to do this over a worksheet or even over the trash can. 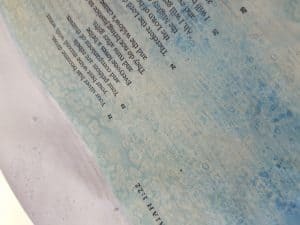 In this closeup above, you can see the watercolor paint lifted from areas of the page and see the texture. Once the paint was dry and the salt removed,I painted a sun with rays using a yellow paint marker. Next, using a black gel pen (the Fude ball pen is my absolute favorite! ), I outlined the sun, rays and mountains. 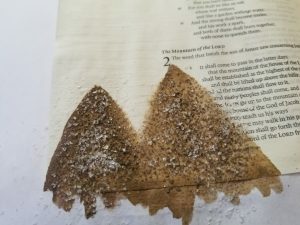 Then, using a white paint marker, I added snow to the tops of the mountains. I really like using paint markers as they give you more control than a paintbrush with acrylic paint. My favorites are Montana paint markers. A bit pricey, but I feel they are well worth it. Then it was on to the verse. I wrote the verse in script using the Fude ball gel pen and then thickened some of the lines using a brush marker. Finally, with a white gel pen, I added some fine lines to the thick part of the hand lettering to give it some texture and detail. 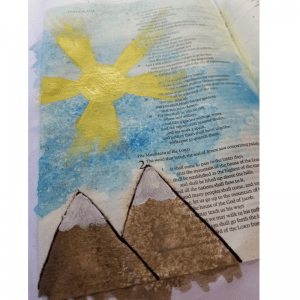 I then wrote the verse, Isaiah 2:3 on one of the sun rays and, finally, watercolor painted the background around the verse. Is it perfect? 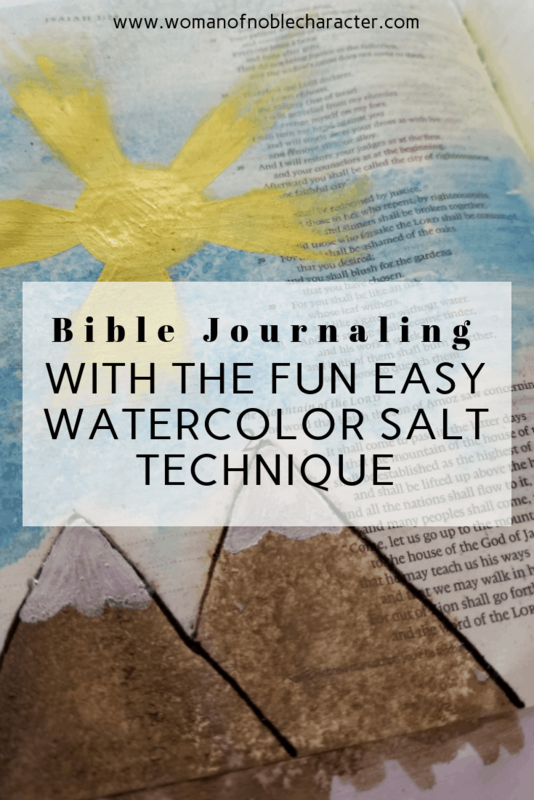 No, but, if you’ve visited my blog before, you know that I strongly feel that Bible journaling is worship and prayer. It is part of my quiet time with God to reflect on His Word and spend time with my Savior. 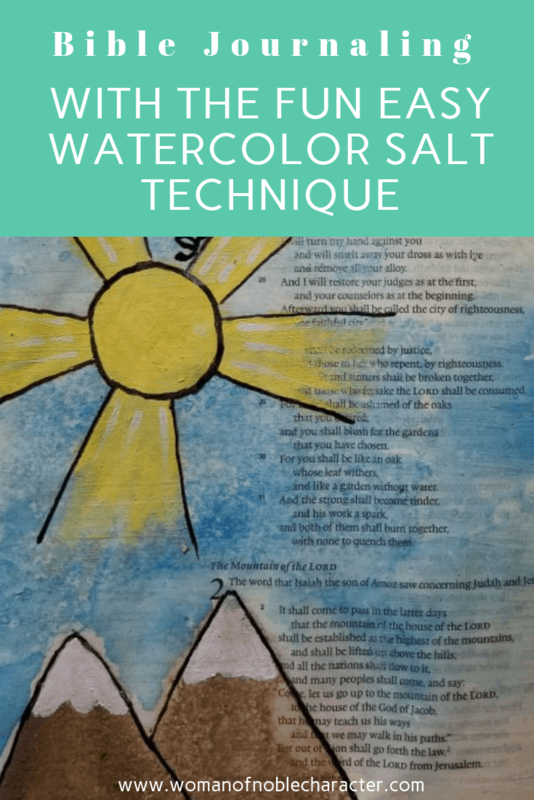 Have you ever tried the watercolor salt technique before? What type of salt worked best for you? In this experiment, I found that the larger the salt crystal, the better the effect. 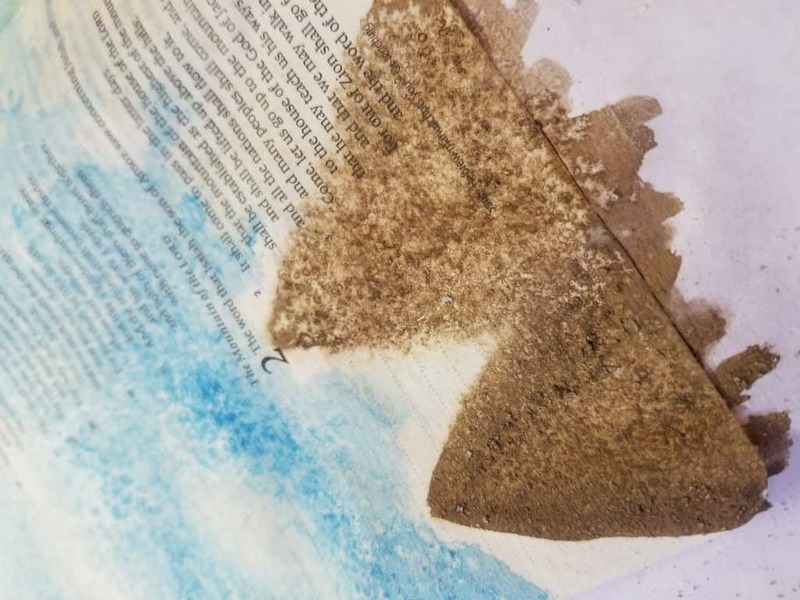 I can’t wait to show you more Bible journaling techniques in future posts. 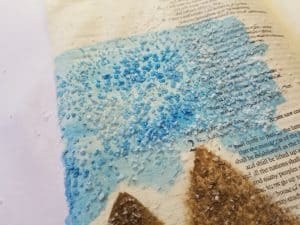 What kind of Bible art journaling techniques would you like to see? 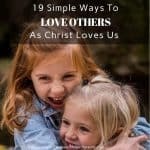 I’m sorry but I feel this is a bit much to do in ur bible its not a coloring book or art class yes u can unline with different things but this is just to much… just my opion..
Hi, Denise – thank you for sharing. 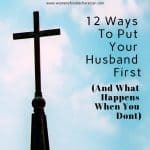 You are certainly entitled to your opinion, but Bible journaling is huge right now. 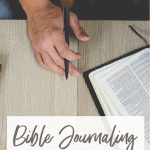 There are Bibles just for creative journaling, books on the subject and so much more. 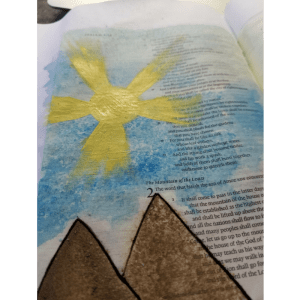 I personally love being creative in my Bible (I have one just for creative Bible journaling) and find that it helps me meditate on the Word. Thanks for stopping by!